Optima Hosting Review 2019: Is Optima Hosting a Good Hosting? 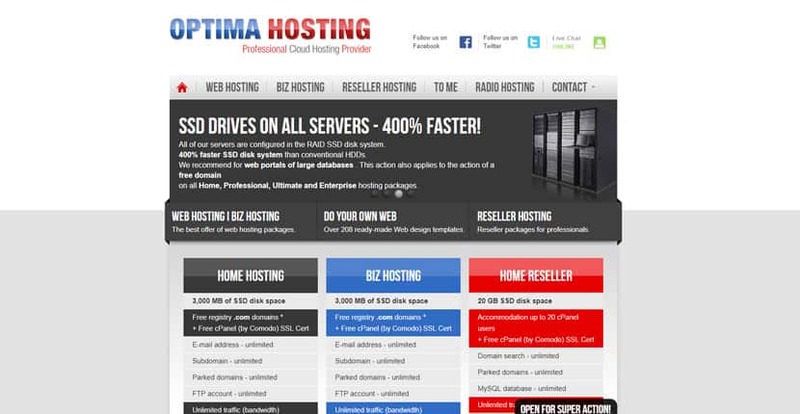 Optima Hosting Data is a Croatian hosting service that provides shared personal hosting, professional hosting, and business hosting on enterprise grade servers that are located in the Capital Zagreb. With a data center in Zagreb, Optima Hosting offers reliable SSD hosting, radio hosting, and reseller hosting packages with 30-days money back guarantee. Their website is available in three languages; Russian, Bosnian, and Croatian. Optima Hosting packages are designed for speed and performance. Powered by Intel Xeon processors with 64 GB DDR4 RAM and configured in SSD RAID, their servers are 4 times faster than HDD-based machines. Network connection is at 1Gbit/s uplink. So you can host all your large websites or web portals without worrying about downtime. Starting with the Home hosting plan, you get 3GB SSD storage which you can scale up to 6GB when you upgrade to their Professional hosting plan or 12 GB with the Ultimate hosting plan. All three plans are powered by cPanel and include SSL certificates, free .com domain, unlimited subdomains, and unlimited email addresses. It’s also worthy to mention that their plans support unlimited monthly traffic. When you sign up, you’ll have 30 days to test their features and see how things work out. You can build a CMS website in minutes by deploying any of the web apps under Softacalous or use their website builder which comes with over 340 ready-made templates. With a simple drag and drop function, their builder lets you lay out pages and add sections such as contact forms, gallery, and maps from a selection of 40+ add-ons and even embed videos to your pages with a few clicks. When you sign, you will be able to build and host database-driven websites on any of their three shared web hosting plans. I like the fact they carry out daily, weekly and monthly backups. So you should never worry about data loss or safety. On-site technicians also monitor the performance of servers and respond to issues that could trigger downtime. If you’d like to start an online radio show or host podcasts at various speeds, their plan with WHMSonic Shoutcast Pro 2 panel will serve you well. You can enter and Radio hosting manage live DJs within 500MB space, create auto playlists, and track listener stats in real time. With this plan, you also get unlimited monthly bandwidth and a HTML5 Player that you can embed on your website. Customers who order a .com domain or hosting package for 1-year or more qualify for up to 30% discount and free extensions. When they place an order and check out, they can pay conveniently via PayPal, Visa debit or credit cards, and Mastercard in addition to Internet Banking. My only concern is that their packages include a 25% VAT. With a friendly and helpful support team, Optima Hosting does it best to address customers’ issues on time. VIP customers enjoy 24-hours support. Telephone operators are available from 08.00am to16.00pm (GMT+2). If you’re sending an email or opening a ticket, be sure to do that between 08.00am to 22.00pm. You can also message the customer service on Facebook. Typical replies are within a day. Optima Hosting offers SSD powered hosting plans with a good number of features that can help you build a powerful website for your Slavic customers in Europe. Wondering how Optima Hosting stacks up against other Web Hosting companies? Enter any other Web Hosting company and we will give you a side-by-side comparison.